We all have nights where we can’t be bothered to cook and we just want to order something. Nothing wrong with that, but why not save yourself some money and calories by making it yourself. In the time you have decided what to order and called them, you could have whipped up this tasty dish. I have some exciting news!!! 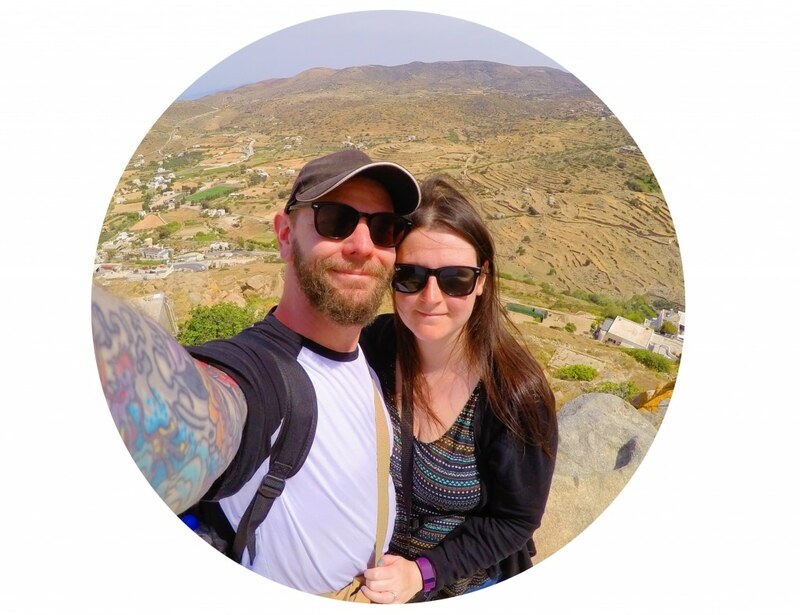 Hungry Healthy Happy has just been ranked the best food blog in the UK! I am so excited and all celebrations should involved delicious food, and gin! My appetite is slowly coming back (I haven’t been able to eat properly for the past 4 weeks), so I am making sure that there is a ton of vegetables in everything we eat as I have a lot of making up to do. My lack of appetite went as far as the thought of certain foods making me feel ill and one of those foods was peppers. But fear not, peppers and I are reunited and we have had a good catch up – they were very understanding. I think sometimes winter comfort food can look so bland, but not when you throw lots of veggies in there. 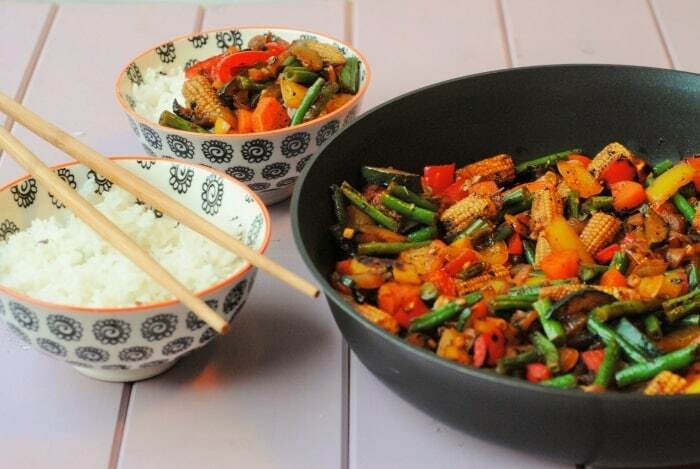 What I love about dishes like this, is that they are so quick to prepare and cook, so you don’t want to be waiting about for 30 minutes for some rice to cook, which is why we use Veetee microwavable rice. With the push of a button we wait for the ding and the rice is ready. 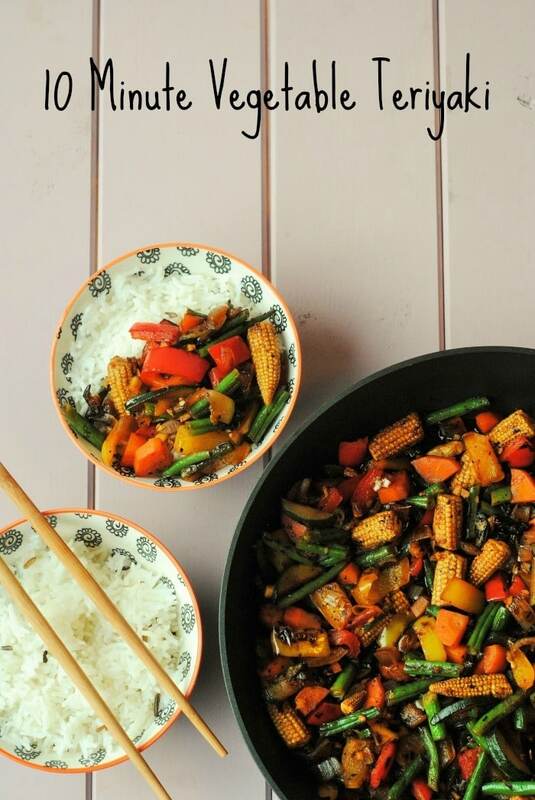 I am a Veetee community blogger, which means I am sharing some delicious ways to enjoy their rice, whether as main or as a side like in this recipe. I have used the Basmati & Wild Rice, but they have a fantastic range of Heat & Eat Microwaveable Rice, that there is something for everyone. They do a wholegrain and quinoa blend that I can’t wait to try out. Oh, and a spicy Mexican rice, I want to try that next too. There is just so many to choose from, but I thought I would keep it simple for the first one. I have lots more recipes planned that are quick and easy, that the Veetee rice would go perfectly with. We are going to be eating a lot of quick and easy meals like this in the run up to Christmas, as there is not going to be any time to cook much else. All of the chocolate eating is going to be taking up the majority of my time. I joke. Kind of. Feel free to mix this dish up, by adding in some tofu, prawns or chicken. It’s also a good way to use up those vegetables in your fridge that are starting to look a bit sad. Bring them to life with this meal. I’m pretty sure you could put teriyaki sauce on almost anything and it would taste awesome. I also love those little miniature corns, so this dish is pretty much a total win for me! I’ve never tried a packaged rice before, but this one looks really good! Congratulations! Well deserved 🙂 All your food always looks so damn tasty! Congrats on being ranked as the best food blog in the UK. 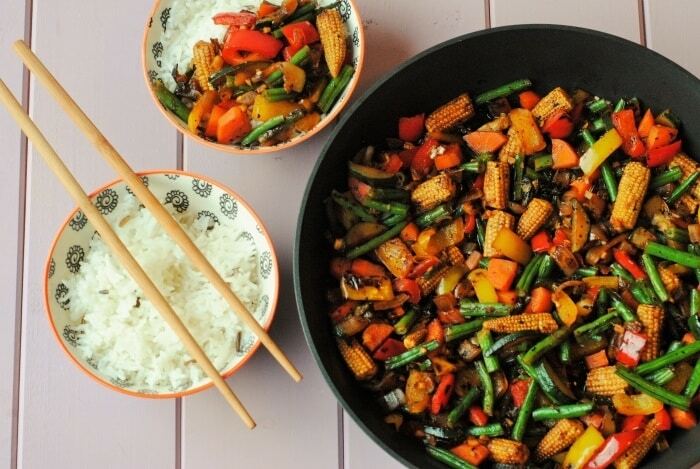 This vegetable teriyaki looks so colorful and tasty.. Seems to be easy to make it too..
Wow! Big congratulations on being ranked one of the best food blogs in the UK. That is quite the accomplishment. . .but well deserved, my friend. And this dish. . .it looks so delicious. And did I read that right – it is quick to make??? What!? Delicious, healthy and speedy in the kitchen? Life doesn’t get more perfect than that. BTW. . .glad to see that you are getting your appetite back. Now your talking! Micrwaveable healthy rice sounds fantastic! 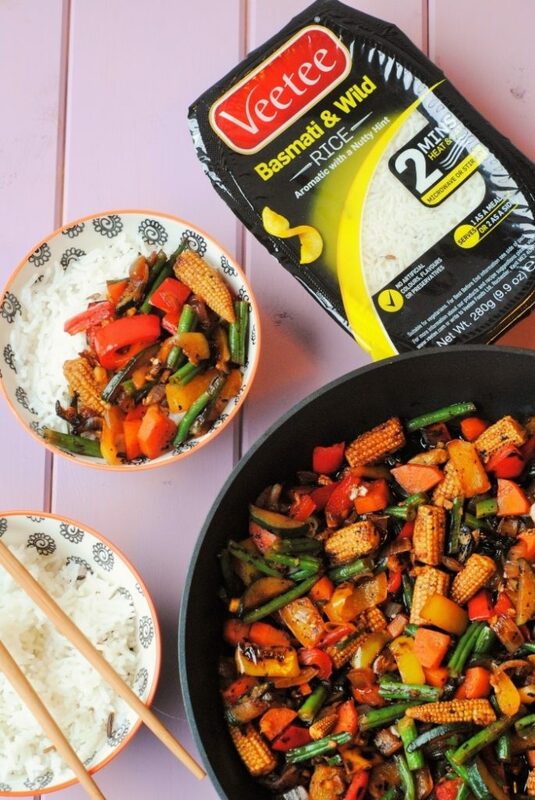 We love these wuick stir fry dinners. So yes, I am now going to be hunting up this brand. Thanks for the info! And the great recipe! 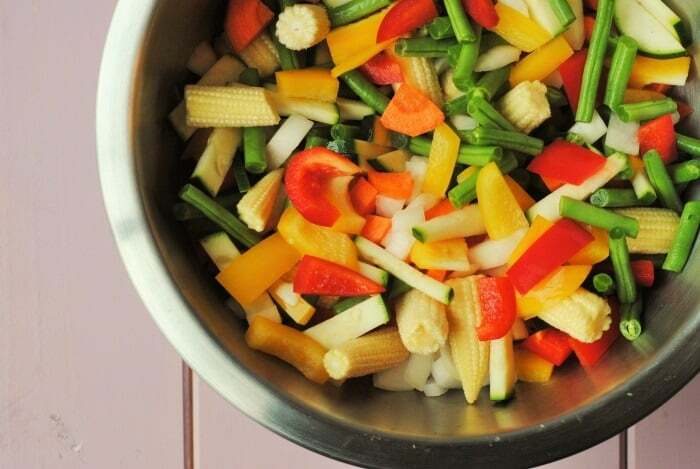 I love how colorful and delicious this looks! Congrats on getting the best food blog rank, that’s great news! That’s good you’re getting your appetite back, Dannii, and this is the perfect wholesome dish to get you back on track! I would love this so much more than ordering out! Yay, congrats, Dannii! That’s awesome!! Love all the pretty colors in this teriyaki dish! Looks so healthy and delicious! Oh wow this looks amazing, and so quick to do too! I am going to have to give this a go! 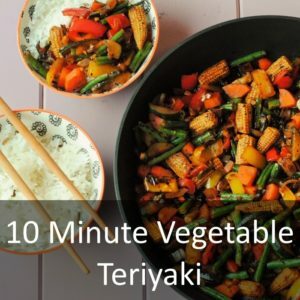 We all love teriyaki at our home and this quick fix is just perfect! 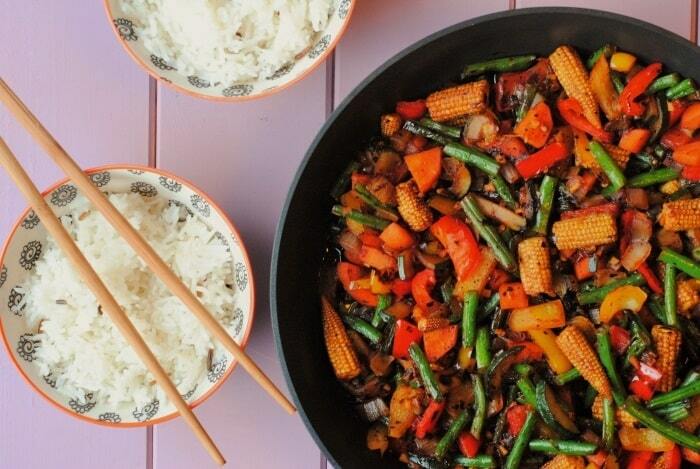 This looks too much like stir fry to me…hate stir fry. Looks appetising though, just don’t think I would make it for myself.